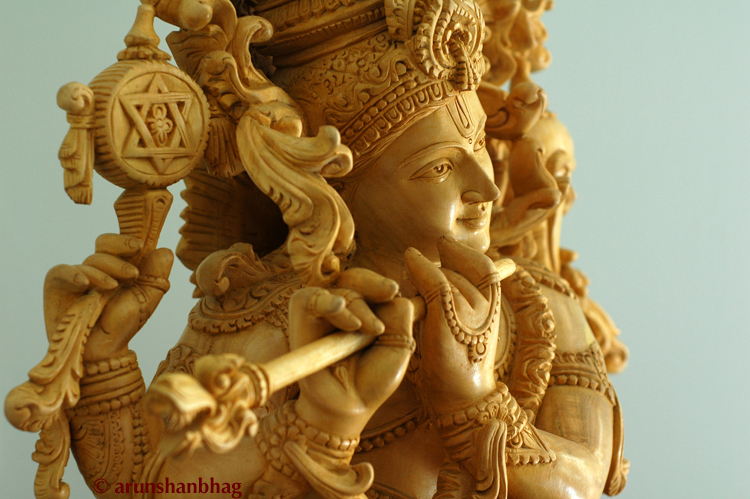 Krishna is the most beloved of Hindu Gods and a popular avataar of Vishnu, the eternal soul of the Universe. While other incarnations of Vishnu crystallize divine traits in ordinary beings, Krishna’s life and experiences on earth symbolize the humanness of the divine. Krishna takes a human birth in a prison cell in the city of Mathura, as the son of Devaki and Vasudeva. Spirited away, Krishna was raised in Vrindavan by foster parents Yashoda and Nanda. His childhood antics endear him to his friends and later devotees, even earning him the epithet of makhan chor – stealer of butter! A baby Krishna digging into a pot of freshly churned butter is commonly depicted in devotional art. At a young age, Krishna subdues the vile snake Kaliya; humbles the Vedic God Indra; defeats his evil uncle Kamsa and liberates his parents. As a skilled strategist, Krishna plays a central role in the epic Mahabharata; helping the Pandava brothers win the war of dharma. His advise to Arjuna at the beginning of the battle is encapsulated in the Bhagvad Gita (Song of the Blessed One) – one of the most important and popular Indian philosophical treatises. It is in the Bhagvad Gita that Krishna succinctly explains the diverse paths to eternal salvation and harmonizes their ultimate goal of spiritual union with God. When a young Krishna in Vrindavan plays his flute, the gopikas (milkmaids) are maddeningly drawn by the magical notes and forget their daily chores. Radha in particular, even goes against social norms and secretly pines for union with Krishna. Their ability to intensely love Krishna and be forever devoted to him, even sacrificing other relations, is the exemplary centerpiece of bhakti. RadhaKrishna painting in the Madhubani style. Thank you; sent you mail. 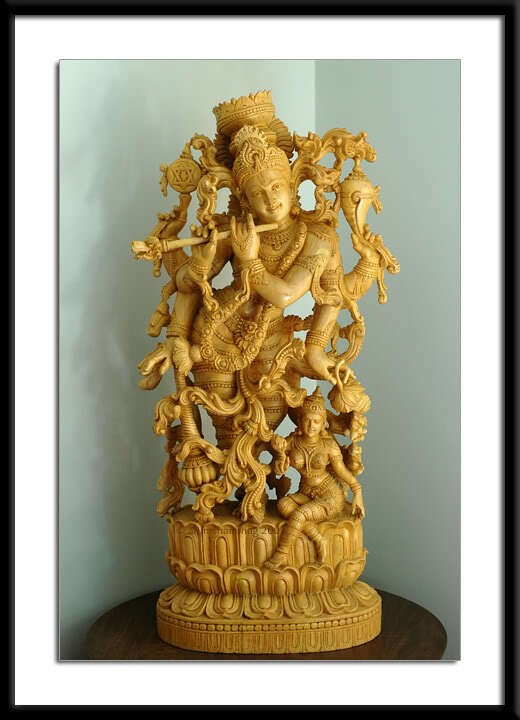 Respected Sir, will you please tell me where to find and buy this Krishna statue? and what is the price? Thank you. This was custom made in Jaipur several years ago. I think now, this may be in the 2-5L range. If you are interested, I can put you in touch with my cousin who had it done. Thank you sir, but it will be out of my range. I wonder if it can be found within a lesser amount of price. The eyes are so mesmerizing. I have saved this picture and see it every now and then. Even, I have made this photo as my cover picture. You are really lucky sir to have him. 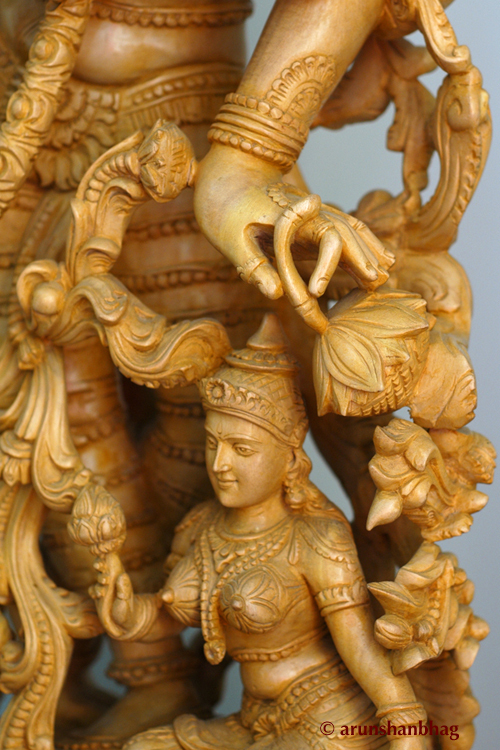 Have you got the statue from South India? Oh, Jaipur works!!!! really priceless! !